It’s been a good two weeks or so since we rummaged through the Fire Emblem: Awakening game files and it’s probably about time for a report. In which case, if you’re interested to know what’s hidden inside the game, but haven’t been following the developments or just want a refresher, then please point your browser to this wonderful page! By the way, if anybody recognises the map above (click to enlarge it a tiny bit), do leave a comment! For some reason, the map reminds me of the Essos continent in A Song of Ice and Fire/Game of Thrones… just the general shape/outline. 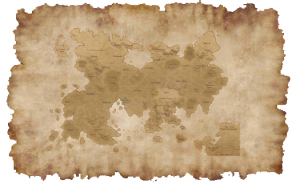 Maybe a map of Ike’s journey? Like he traveled the entire continent before settling in the lower right… I dunno. Looks like Elibe to me. There are slight differences in the areas that would be Etruria and Ilia but the general shape is similar. It is worth mentioning that where Bern would be there is a name that looks to be 4 letters and is likely Bern. Many of the mountains are in similar places though they appear to be spaced out more.